This boot manages to combine lightness and flexibility with comfort and support. The improved wrap-around ribbed sole offers protection and superior grip, which blends over the top of the boot into a super grippy compound which provides extra padding and hiking security where you need it most. 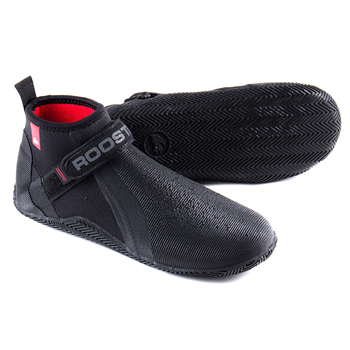 The 5mm neoprene has a red, soft, plush lining with a reinforced heel support and pull tab to make it easier to put on and take off. There is an adjustable neoprene ankle strap and soft elastic binding at the top of the boot.